Bubblegum pink is the nail polish of the day. Matt Higgins will definitely like it – he’s into all things girly-girl, so I add another coat before blowing on my nails. Tonight we’re meeting at this field party and I fully expect we’ll make out in the bed of his truck. “I can’t stand the idea of you holed up in your room while I’m playing ball this spring. You should come to practice tomorrow morning.” He smells a perfume ad, cringing and sticking his tongue out. My heart pounds faster than light speed. I hate baseball. I know, I know. That means I’m not a true American. It probably means I’m not human. But I gave up foam fingers, peanuts and the Atlanta Braves when my mom announced she’s a lesbian and ran off with her friend who was more than just a friend. A year ago January, she divorced my dad and I divorced her dreams of me playing softball for Hundred Oaks. “No way,” I say, examining my nails. “Come on, Parker!” He thumbs through the magazine. “Please?” he whines. “What’s involved?” I try to act nonchalant, but Drew looks up with a knowing smile. He’s been my next door neighbor my whole life – I’ll do anything for him. Taking stats is way easy. I could do it in my sleep. “Don’t change the subject… So there’ll be plenty of guys for you on the team.” He snorggles. That’s mine and Drew’s special word for snorting and giggling. It’ll be in Webster’s any day now. I have to admit I love the way cute guys look in baseball uniforms. Plus, I’d get to spend more time with Drew. Lately his idea of fun has been going to Hardee’s with Corndog and Sam Henry and acting like they’re the characters from Seinfeld, talking about nothing. Drew invites me along sometimes when they need an Elaine because I’m really good at punching Corndog (George Costanza) and yelling “Get out!” and Drew says I dance worse than the real Elaine. But it’s been getting kinda old. How many times can those guys debate who has better fries: Sonic or Jiffy Burger? And what else do I have to do this semester? I’ve got a 4.0 and classes don’t matter at this point: the only way Vanderbilt could revoke my early admission would be if I encouraged Tennessee to secede from the union. On the other hand, this could be a lot of work. I’d probably end up doing hard stuff like lugging water coolers around and washing dirty jockstraps or something. On the other hand, I don’t want to be lonely. Add STEALING PARKER on Goodreads! This book will release in October 2012. Hey, I’m a HUGE (when I say huge, I mean HUGE!!) fan of Catching Jordan. It is my absolute favorite book in the entire world!! But I was just wondering is this book a sequel to it? Or just similar to it?? Thanks! Thank you so much for responding! I am truly looking forward to the next books that you are coming out with! I bought Catching Jordan three days ago and have already read it 2 times! Then I let my friend borrow it because we Love these types of books! And I just think that Jordan and Sam are the cutest! I can’t wait for this book to come out! After reading this excerpt I can’t help but wonder is the Jordan/Sam romance going to be in this book as well? Kim – Thanks so much! I am glad you and your friend enjoyed Catching Jordan. In your second book are Jordan and Sam still happily together?? Nikki – You are naughty! 😉 I won’t answer that outright, but I will tell you that you get to see Sam and Jordan together in a scene very quickly. Drew (mentioned in the scene above) is a running back on the football team, and he’s mentioned in Catching Jordan several times…. I JUST LOVED CATCHING JORDAN!! I read while I was ill and it brightened up my gloomy day. I just had one question about Jordan. I can relate to her being on of the guys, but in the next book even with Jordan not being the star of it, will we get to know if she chooses Michigan and becomes one of the guys with their team? Hi Hunter – I’m not sure yet! If not in book 2 then you’ll find out in my third book. 🙂 I’m so happy you loved Catching Jordan – thanks for writing. Hey! So I’ve read Catching Jordan over 3 times already in the past 2 days!! This book is everything I like that’s in a book and I’d like to say that this is an amazing book!!! I am slightly in a sad faze right now because I thought the books were going to be over, until I checked your website and saw that you are writing another book!!! Words cannot describe how siked I am for this new book to come out! Plus I kept thinking to myself it would be awesome if you did like a sam’s point of view on everything that’s happening to Jordan. Sorry for the long response its just been a while since I’ve been so immersed in such a great book!! Also can you give more details about the second book like the plot line and who is the narrator? thanks lots!! Larissa – I’m so glad to hear you enjoyed Catching Jordan. What a nice Xmas present for me. I guess I need to put up a blurb about my next book. My editor hasn’t written one yet! haha cool! I look forward to reading it :D!! ahh but once again, I keep rereading the book!! That’s how good it is, I have so many favorite parts that I would basically just be re-reading it again and again!2 thumbs up to you!! Thank you! 🙂 I am so happy you liked it! No problem!! and oh! will ty be in the next book too? Ty makes an appearance, yes. 😉 I’m not giving any details though. nice!! and ok once again very excited!! I bought catching Jordan in the evening yesterday and I didn’t put it down until I finished it about 5min. ago!!! When do you plan on releasing your next book?? Thanks, Tess! My next book (the title is still TBD) comes out in October 2012. Catching Jordan, was a great book, I really like the way Jordan Woods and Sam Henry end up together…I enjoyed the ending of the book, it was great! Thank you so much. One quick question are you going to write a sequel to Catching Jordan? I really wanna know what happens to Jordan, Henry, JJ, and Carter. Thanks. Alexis – I’m glad you liked it! Currently I have no plans to write a direct sequel, but Jordan and Sam are characters in my next book coming out in October 2012. Best wishes! I have to say I like companion novels, but I really hope you write a sequel to Catching Jordan!!! personally I would love to get to see Jordan in college when football get serious. See her interact with both Sam 😉 and the new team. Also, if Sam does go to the other university to play football, won’t there be some rivalry?! So pleeeeease right a sequel to Catching Jordan…because I was literally up all night reading this book I COULD NOT PUT DOWN!!! @Allie – Thank you! I am glad I kept you up all night. *evil grin* I will consider a sequel but I’ll have to think about it. I kind of want people to imagine what happens with Sam and Jordan, much like you already have. Thanks so much for reaching out! @Amber Yay! I hope you enjoy Stealing Parker. Lots of old characters pop up for mischief. Thanks for your comment. If the plot is anything like that of Catching Jordan, then I will bet that Parker isn’t going to end up with the coach. Lol. Yay, Miranda! How exciting! What a fun excerpt. I love that we’ll get possible cameos from Catching Jordan characters. And your cover is fabulous. I loved Jordan and Henry and I’m really glad you deceided to have a companian novel. But I have to ask what made you deceide to add a follow up novel? Hey Miranda 🙂 Just wanted to drop a quick comment and tell you just how much i loved Catching Jordan! It was without a doubt one of my favourite books i have ever read! 😀 Also Stealing Parker seems to be just as amazing as Catching Jordan from the excerpt above! Can’t wait for its release in October! Btw i would also loveee to see a sequel to Catching Jordan as others have mentioned 🙂 Hope you have a great New Year! @Ria: I didn’t want to leave my characters behind! And I love the world they live in, so it’s really fun to write new books set at their school. @Angie: Thank you! That means a lot to me. This book was amazing!! I am from nashville and I loved how Jordans dad play for the titans bc im a huge titans fan and then i love tht her brother plays for tennessee cuz i love the vols!! I think this is one of the first books tht i have read where the book takes place in tennessee and i love it!! 🙂 i cant wait for the next one to come out me and my sister staye up all night reading it and then we reread it the same day!!! I loved this book! Much like other readers I just couldn’t put it down and I am reading again right now. 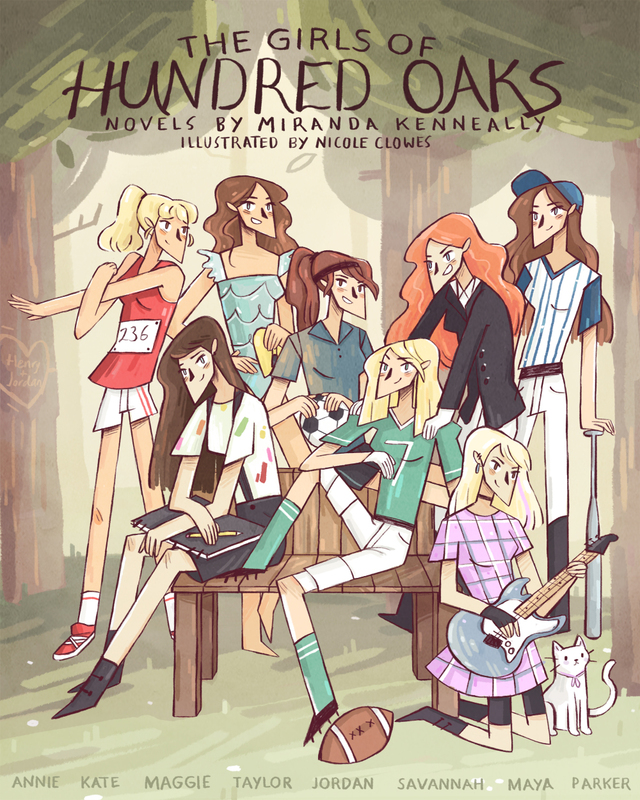 I am a huge fan of sports and romance and this story is so perfect. I loved all the excitement and have to admit I squealed, laughed and cheered with Jordan on her journey. Not only can I not wait for the next book, but Catching Jordan has to be made into a movie! Congratulations Miranda on such a successful story! I LOVE CATCHING JORDAN!!!! I’ve read it like 12 times in the last 8 days. Do you think it might ever be a movie? Because I would definitely go and see it. OMG!!! i loved the book catching jordan sooo much it is my favorite book at the moment!!! please right a sequal i really want to no what happens to Jorder and Sam in college!!!! I have made assumptions to what happens for them in the future but i would REALLY love for you to right a sequal just so i can make sure they make it. My name is Emily McGonigle most of my friends know me as Em. I picked up your book on a Saturday night and by Saturday afternoon I was finished and begging for more. I feel like I could really relate to Jordan and I love when an author can make me think that. See, I’ve been a volunteer firefighter for four years, I’m 18 now (technically 17 but my birthday’s in like a month), and I love when an author makes the female protagonist so… awesome! I can’t wait for your other books to come out, I’m definetley reading them while on base (did I mention I’m with the Air Force?). Anyways, I was just writing this to thank you, your writing is so easy to follow and the plot hit close to home (in a sense replace sports with firefighting and you got the relationship). Maybe one day I’ll have one of my books published… at this rate anything’s possible! Keep up the fantastic work! Catching Jordan is one of the best books I have ever read!! I have read it like 7 times in like 5 days!! Pease please please do a sequel to Catching Jordan?!? I really want to know what happens to Jordan and Henry, I liked him way better than Ty from the start. Can you give us hints on how their relationship went and if Jordan went to Michigan state? Please Please do a sequel to Catching Jordan!!!? I loved this book it was AMAZING,, I want to no what happens with Henery and Jordan!!! Please……. AND I AM A BIG BIG BIG FANNNNNN!!!!!!!!! I was just wondering if you could tell me what page we meet drew in catching jordan because I can’t find him. But I <3 this book if this is made into a movie I will go see it. I have read it three times and I plan to read it again sometime soon. @Melanie Drew Bates is mostly only known as “Bates” in CATCHING JORDAN, but he’s one of the main characters in STEALING PARKER. You’ll also get to see plenty of other new characters. @Everyone Else – Thank you for your comments! So glad to hear you loved Catching Jordan. I recently sold film rights, so maybe there will be a Catching Jordan movie. I’m not sure if there will be a sequel to Catching Jordan, but you’ll definitely get to see Jordan and Henry in my next two books. i was just wondering how big of characters jordan and henry will be in your new book. I am in love with Catching Jordan!! It is my all time favorite book! I can not explain how much I relate to Jordan. With her and the football team, Henry, and just everything in general! I am so excited for Stealing Parker! wait so the coach is higgins??? yes ,i know absolutely loved the book,congrats on selling movie!! i just was confused didn’t realize the coach was gonna be a whole new character!! super excited though amazing!!! Oh my gosh I am so dang excited :)! Also are any of the football players from Catching Jordan playing baseball in this book :O!? OMG!!!!! i love Catching Jordan!!!! i stayed up until 3am to finish reading it…i just could not stop!!! now…i can’t wait for Stealing Parker and Bad, Bad Thing!!!!! i’m absolutely and totally in love with Catching Jordan, i just can’t put this book down! i was so hooked that i even searched for your works. luckily i found this one, and i’m so gonna buy Stealing Parker!! i’m gonna miss the characters in CJ but i know that i’ll see them here, and also new characters.. looking forward to this book!! I was wondering what the second book/seuel is called. I absolutely adored Cathcing Jordan. It was my favorite book in the world!!! WE ABSOLUTLY LOVED THIS BOOK!!!!! We had a waiting list of 10 girls at our school, and half of us read it in less than a week!!!!!!! IT WAS the BEST book I read all year….CAN NOT wait for the next book to come out. Literally can. not. wait. AHHHHHHHHHH october is sooo far away!!!!! I LOVED catching Jordan, its now one if my favourite books! I love Jordan and Sam<3 their so cute… I really want there to be a sequel! I love Catching Jordan and am really excited about Stealing Parker! I play Softball and don’t know much about Football (Eventually I figured it out and understood what the plays meant) but am happy I am going to read the next book about Baseball so I will understand. I was wondering if you countinue the series will you have the seprate books about diffrent sports? I would love it if you would do one about Softball or Swimming! I am really into the Hunger Games and love to read so i will probably end up reading Stealing Parker until October 1st! I’m really exited about this book. I love how in your books the main characters are independent and strong woman who love sport. I can really relate as I play in a boys Australian rules football team, the guys treat me like one of them and they know I’m just as good even though im a girl and love doing Girly things sometimes. I love how you don’t stereotype females as the weaker gender cause not all of us ae. I can not wait until this book, you are amazing! Also a quick question do you have an official release date for this book? @Imani – Thanks so much for your kind words! The official release date is October 1, 2012. @Tatiana I’ll think about it. 🙂 Maybe after I finish writing my next book. OMG I love CATCHING JORDAN! Such an amazing book. Read it twice on the day I got it. I can’t put it down. Love everything about it. I need more. I need STEALING PARKER to come out now. I am excited for new characters but also reading more. I love how you created such bada** female characters. The book makes me want to go back to high school. Please please please do a sequel to CATCHINH JORDAN. Thanks for being awesome!!!! Catching Jordan is such a great book! I’m so looking forward to your new book. Plus, I play softball since I was 5 and I’m so excited that this new one is about baseball and softball. I really hope Henry and Jordan stay together in this book! And are Henry and Jordan going to be main characters? OMG! I loved Catching Jordan soooo much! It is absolutely my most favorite book i’ve ever read! When I first got the book i finished it in a day, and i keep rereading it! Im so excited for the next book! Hey miranda. I am absolutely in love with catching jordan. Can you please write another book with just the characters from catching jordan? I would love to know more about sam and jordan’s relationship. @Emily – Hey, thanks for your kind words. I’m not planning to write a sequel, but Sam and Jordan are in the other books I am writing. I think Sam and Jordan are pretty happy and I can’t imagine finding enough conflict between them to write a sequel! I just re-read Catching Jordan (for the millionth time ) and I just wanted to state how much i absoolutely loved it !!!! I just read the book for the first time this summer and I have to say that I fell in love with it. I was re-reading it recently and my jaw dropped open when I found out there are 2 more books and counting! I litterarly ran to my computer and reserved those books from my library! I’ve read both catching jordan and stealing parker multiple times and i cant stop reading them! are you writing another book? and they going to be in it?! @Nicole – Yes, my third book THINGS I CAN’T FORGET comes out on March 1, 2013. You will get to see characters from both Catching Jordan and Stealing Parker. When will this book be available on iTunes. Just finished reading CJ and can’t wait to read this one. Hi Miranda! I just read CJ and SP and I must say you really are brilliant. While reading the books, I imagined it as a movie already with recurring characters and all. I like your style of writing. If I may just ask though, did Sam played baseball in CJ? I know he plays football but I don’t think it was mentioned he plays baseball too. @Jayneca Thanks! Glad you liked the books. Sam didn’t mention that he plays baseball in Catching Jordan, but at Hundred Oaks, football is played in the fall and baseball is in the spring, so the sports don’t overlap. I love love love Catching Jordan so I decided to read Stealing Parker! I’m a little confused though… Not sure if it’s because I haven’t read far enough in the book or not but still a little confused. In Catching Jordan Sam Henry is a senior like Jordan is on a football team and are beginning their college journey at the end of the book so my question is! In Catching Jordan Sam is a senior looking to go to college how is he playing on the Hundred oaks high school baseball team in Stealing Park? Catching Jordan takes place in the fall. Stealing Parker takes place in the spring. Ohhh silly me… That makes since now that I think about it 🙂 Thank you for clearing that up for me! I was able to finish CJ in less than a day!! That’s how good it is. And dont worry about me coz i’ll be getting a copy of your next books for sure! It’s amazing how you got me guessing on what’s gonna happen next the whole time. Im gonna make sure everyone here in the Philippines gets to read books by you!! 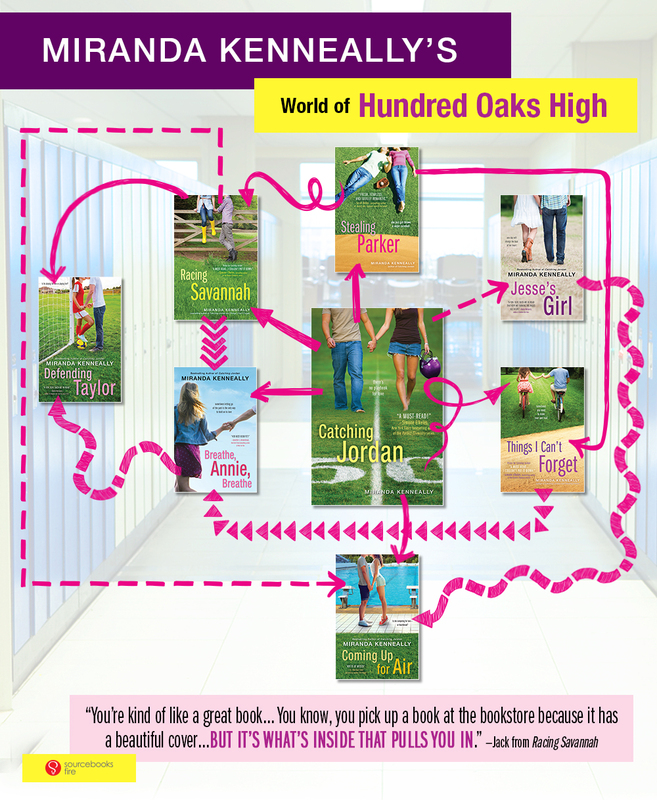 Hi, so this doesn’t even begin to sum up how much I loved CJ, SP, TICF, and RS (I really related to CJ cause I play football) but I loved the books and I was wondering what the next 2 are going to be named/about? Is there a volleyball book? Hitting (on) Lexi, a volleyball book, would be a hilarious title (I just used my name cause, yeah) but anyways, you are basically a goddess, I love your writing, keep doing what you’re doing! @Carolyn Yes, you can learn more about them in Things I Can’t Forget and Racing Savannah.